Peach season is short and sweet, extend your enjoyment with this delicious recipe. Three ingredients is all you need to make your own luscious peach butter. In a large, heavy-bottom pot, stir together the peaches, spices and honey. Cook over low-medium heat, uncovered, stirring frequently, for about 45 minutes, until the peaches begin to break down. Cook the peach puree another 15 to 20 minutes, stirring frequently, until the mixture is thick and spreadable. Remove from heat and let cool. 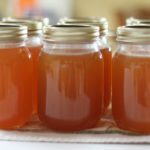 Pour into mason jars or sturdy plastic containers, cover and refrigerate. Spread peach butter on waffles, pancakes, toast, scones or biscuits to liven up your breakfast, or drizzle over a chunk of salty blue cheese on an appetizer platter. Add vanilla, mango or strawberries for more exotic flavor combinations. Peach butter will keep refrigerated for a few weeks.